Not just in time for Halloween but close enough to still be talking about dismembered things (it's only 3 days later!) I found this wonderful Dexter flatware created by, ahem, Steve Butcher in homage to the sociopathic serial-killer-hunting Dexter. This silverware has been sawed, slashed, burned and punctured, which "truly reflects the activities of Dexter." 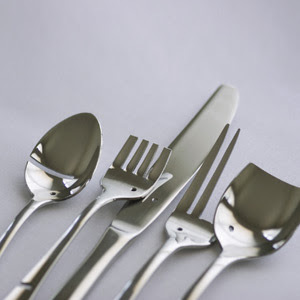 Although the silverware has seen some rough use, we're assured it's usable, which is good because a five-piece set will cost $400-$500 depending on if you want the modern, classic or antique version. I found it over on Spring but don't see a direct link...just look under the "shop" section and you'll see it.